It is early summer in the Rocky Mountains and the Larkspur blossoms accent the hillsides with their vibrant deep blue violet hues. 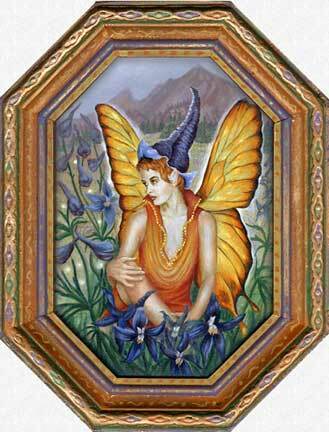 This pretty faerie likes to wear a wildflower blossom for her cap. The original painting was stolen from a gallery in Estes Park, Colorado in mid-January 2001. If you see it, please email me the information. If retrieved, there will be a reward.